Pat the steaks dry, then season lightly with salt and pepper on both sides. Rub with the olive oil and allow to sit at room temperature for 30 minutes. Prepare grill by heating it to medium-high. Once hot, clean the rack, then using tongs and a cloth, lightly apply olive oil to the grill rack. Arrange the steaks on a grill and do not touch for 2 minutes. This will help them to not stick to the grill. After 4 to 6 minutes depending on the thickness of your steaks, flip the steaks with tongs and grill for 4 to 6 minutes more. The steaks should be well-marked with lines from the rack and still soft to the touch when pressed with your finger. 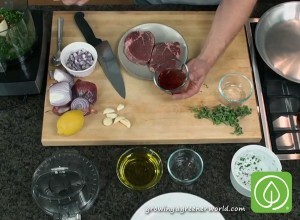 Transfer the steaks from the grill to a cutting board, loosely cover with aluminum foil and allow to rest for 10 minutes. Slice thinly against the grain of the meat, for the tenderest bites possible. Combine all of the ingredients except water and oil in a medium mixing bowl, and mix together. Allow to sit for 5 minutes for these wonderful flavors to marry. After 5 minutes, whisk in the water, then the oil. There you go – fresh chimichurri sauce! Serve immediately or store in the refrigerator for up to 2 weeks. To serve: Drizzle chimichurri sauce on the plate, then arrange thinkly-sliced steak on top. Enjoy! Hi Nathan, I watched your show today and you provide an inflection on this recipe by putting it in an oven friendly pan, searing in the pan and then putting in the oven. I missed the temperature and time you put it in the oven for. If you could provide, that would be awesome. Great looking meal. I can’t wait to try it. I saw your show for the first time today and am interested in the grass-fed beef. Concern about GMOs has increased and I am becoming more aware of this manipulation of our food sources. 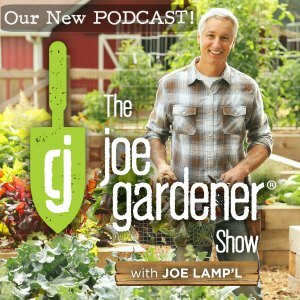 Are you strictly vegetable-based or do you have articles/shows that serve to educate people about GMO alternative foods? I am also curious to know where safe, reliable sources of these GMO free foods are available to purchase both as a consumer and as a retail grocery/caterer/deli store owner. Today was my first time seeing the how. I love it. Clean, healthy and delicious. Keep it going. Thank you.